Around 20,000 tribal farmers from across Maharashtra made steady inroads from Thane in Maharashtra, along heavily-patrolled Mumbai roads, right to Azad Maidan on November 22, 2018, where they gathered to agitate, once again. The most recent drought in Maharashtra, which is a by-product of delays in admission and attempts to deflect blame by the Devendra Fadnavis government, has wreaked havoc across the state. This is the third mass farmer protest in Maharashtra in a year. The first was in March when farmers demanded a farm loan waiver followed by another in July by dairy farmers who sought a hike in milk prices and now this is for the drought which has affected nearly 90 lakh farmers in Maharashtra. Maharashtra's water resources and irrigation minister Girish Mahajan met the tribals from north Maharashtra, Vidarbha, Marathwada, Ahmednagar and other districts and asked them to meet with chief minister to which the farmers agreed. The Devendra Fadnavis government in Maharashtra had, after an inordinate delay, declared on October 31, 2018, a drought in state’s 151 talukas, of which 112 were hit rather severely. Apart from the delay in the announcement, which has a cascading effect on the state benefits that would just take too long to trickle down to the farmer beneficiary and have any required effect, it’s the state government’s awry policies that have affected the tribals drastically. Forced to stop after every 10-odd painful steps and sit down on the pavement to tie his heavily-swollen left foot with a make-shift tourniquet to tackle the agony, Pawra tribal Sheeldar Darji from Jalgaon made it to Azad Maidan with a familiar lot of tribals from a neighbouring village. “He is unable to walk but insisted on coming with us. 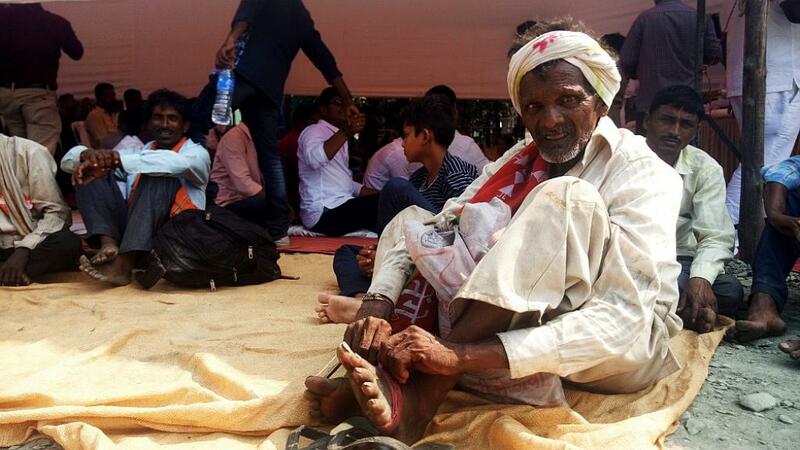 He walked till here all the way from Thane despite the pain,” says another Pawra tribal youth who sat with him at Azad Maidan hearing Lok Sangharsh Morcha’s general secretary Pratibha Shinde. “This government will have to compensate us for the losses we suffer,” said Shinde at the rally followed by claps from among the tribal audience. The drought, declared after ground verification and on the basis of indicators like rainfall deficit, reservoir storage, groundwater index and soil moisture, has wreaked havoc on the tribals. But, what makes things worse is that in the absence of their names on the 7/12 extracts and official land ownership titles, they do not stand a chance of availing any relief that may come through from the government either. So, Ambikabai Barela of Chopda Taluka, Jalgaon district, even left behind four of her children and an ailing mother-in-law in the care of a neighbour and walked all the way to Azad Maidan with her youngest eight-month-old daughter Sonakshi to seek a solution to her own problem. “The drought has been so bad this year that the produce is affected badly. We may not be able to produce any jowar in our fields,” she says. And, what makes things worse is that even she doesn’t have her name featuring in the 7/12 extract, which disqualifies her from any benefits that may accrue by way of doles offered by the Centre or state. Ambikabai, like hundreds of new mothers, sat peppered across Azad Maidan hearing the Morcha’s spokespersons speak to the rally about a meeting with the CM. It may be recalled that Fadnavis had to swiftly recall his decision about declaring a drought after a visit by a team from the Union government owing to overwhelming public pressure. And that, is not being taken kindly by the tribals affected adversely by the state policies which clearly favour sugarcane and cotton lobbies. The state government has been encouraging the use of tube wells to pump out ground water particularly for water-guzzling crops such as cotton and sugarcane, thereby leaving little water for drinking and making other areas prone to drought. It’s a man-made drought like all others.